For those that like to keep their shaving routine classic and traditional, a good quality shaving bowl is important for a good lather. Many shaving bowls are made of either wood, stainless steel, or porcelain, and they can be smooth and circular, or ribbed and mug-shaped. 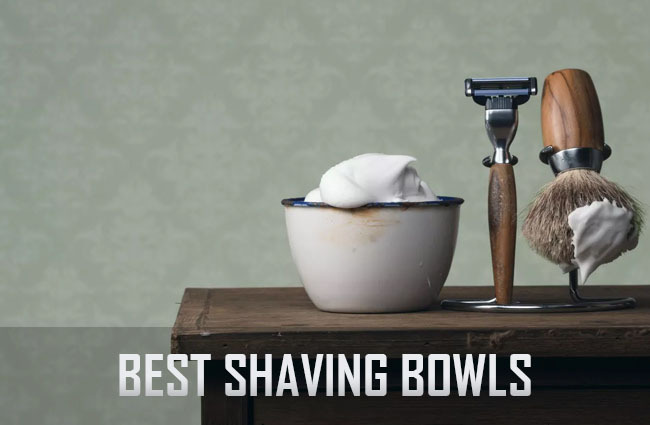 Below is a list of some of the best shaving bowl options on the market, based on their quality, usability, user popularity, and overall rating. 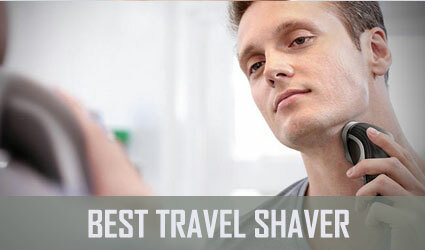 There are several different kinds to choose from, based on personal preference, so browse through our list before deciding on the best shaving bowl for you. 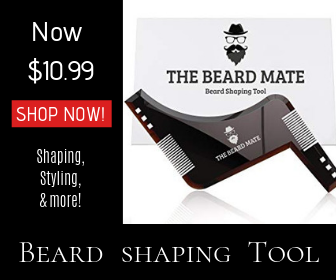 Made in Australia, this shaving bowl is constructed from heavy duty stainless steel that’ll last for years, and has a rough and tactile texture for optimal grip, with a rugged and manly aesthetic. Its microscopic finish allows for extra lather consistency and volume, for a less runny shaving cream, ultimately giving you the smoothest shave. The bowl is able to retain heat to keep the shaving cream lathered, but for those that use pucks, the soap may end up all over the bowl and on your hands, since the bowl tapers at the bottom, which doesn’t let the puck sit still. You can work your shaving cream to the ultimate lather with this high-quality stoneware shaving bowl. 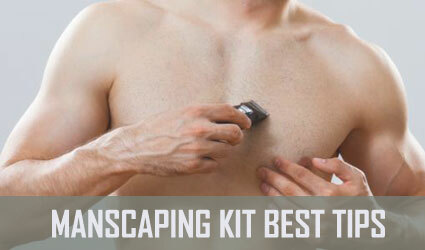 Because of its tough construction, it will last you many years and good shaves. The ball grip handle is ergonomic, so you can hold it comfortably as you’re applying your shaving cream, and so that you know for sure you won’t drop the bowl. The bowl is quite large, which means you’ll be able to fit a large quantity of lather in it, as well as stir it vigorously without spilling it. It also comes with a brush made of badger hair. 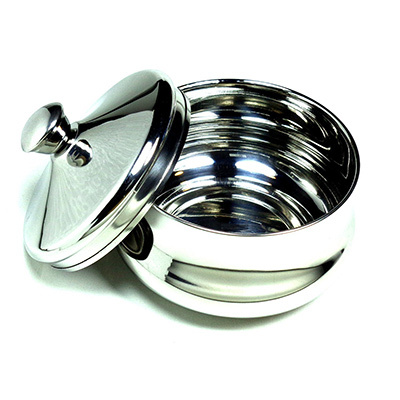 For easy clean up and reliability, this shaving bowl is made of attractive, polished stainless steel, and fits almost all shaving soaps. The bowl measures 3.5 inches at the top, 4 inches at the bottom, and at least 2.25 inches in depth. It’s ideal for those who prefer wet-shaving, and because it comes with a lid, your soap won’t dry out between uses. 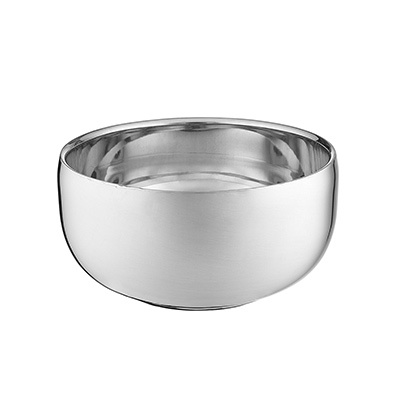 The bowl isn’t chrome-plated, so you don’t have to worry about the finish peeling, flaking, or becoming discolored. The only real downside is that the bowl can get really hot, which makes it hard to hold using your bare hands.  Also one of the best shaving soap bowl options to be used with many soaps, this product is practical for any wet-shaving routine, and can serve as an essential tool for shaving brush users. 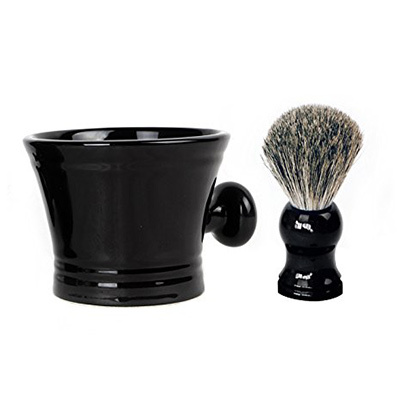 If used with a good quality soap and hot water, this bowl can work up a rich lather for smoother wet shaving. Because it’s made of porcelain, the bowl retains heat nicely, and the handle makes for a sturdy grip. 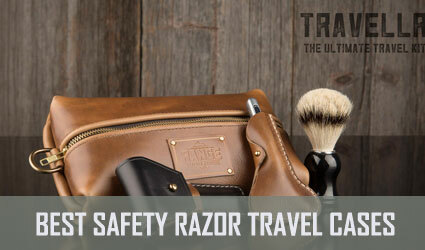 Its durability prevents chips, cracks, or flaking, making it last for many future shaves. It didn’t make it further down on our list of best shaving bowl models because its walls are apparently a bit thinner than expected. 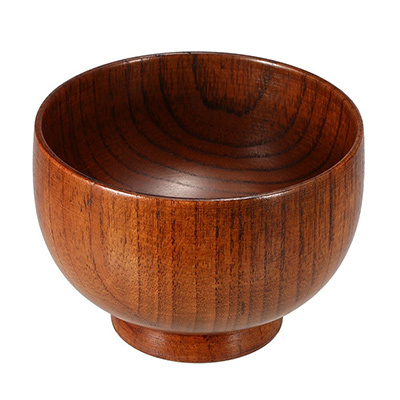 This bowl’s quality craftsmanship makes it lightweight, firm, and environmentally friendly. If you’re looking for a wooden option, this is the best shaving bowl for you. It has a fine texture both inside and outside, with a delicate, high-quality wooden appearance. The bowl is easy to clean and anti-adhering, and because it’s also corrosion-resistant, it’s durable enough for long-term use. The size of the bowl can easily fit any cream, puck, and brush, for a nice and foamy lather. It is a bit on the small side, but other than this, its deep and rounded bottom helps prevent messes and provides an ideal wet-shave routine. 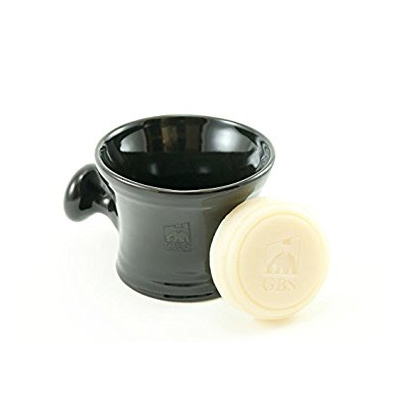 Crafted from sturdy and durable ceramic, this shaving bowl/mug is wide enough to whip up your favorite soap into a large foaming lather. 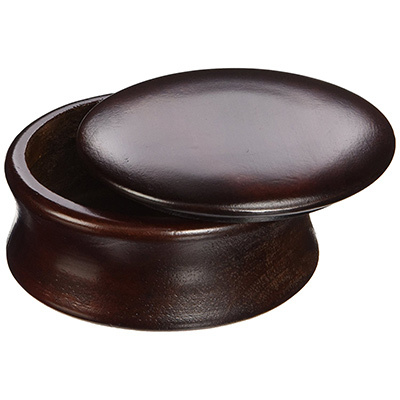 Its large size allows you to put several soap pucks inside, and its comfortable side handle offers a better grip as you carry out your wet-shaving routine. 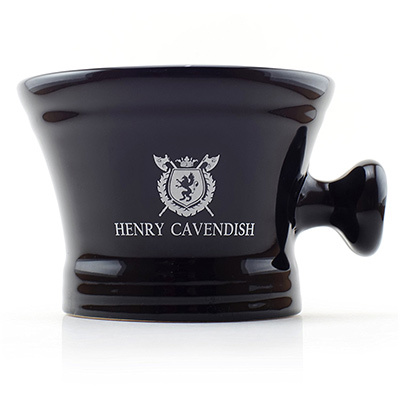 If used alongside a Henry Cavendish all-natural soap and badger brush, the mug can give you a satisfactory shave, as it keeps in heat and improves one’s shaving experience. You may get soap on your hands since the mug is deep, but it’s ideal for melting soap pucks in and starting the day with a fresh shave. 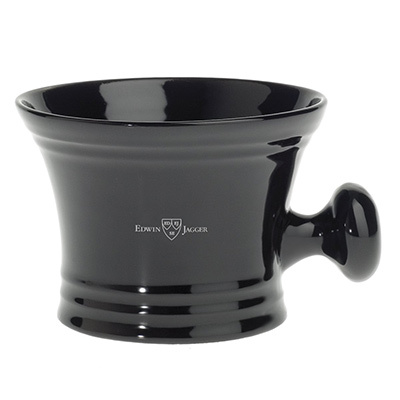 This old-fashioned, heavy-duty shaving mug can fit up to 4 oz. of soap, and because of its deep interior, it can provide a proper lather from your shaving soap. The large knob handle makes it easy to grip while lathering, and along with the mug comes a 3 oz. ocean driftwood scented soap puck. Some may find the mug to be a little too wide and deep to hold it while lathering, but it keeps your soap warm while you’re shaving, and it’s durable enough to last you quite a while. While you’re here, you may also be interested in learning about the best shaving soaps on the market. 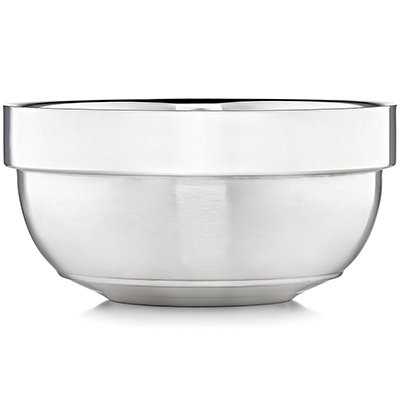 Sturdier than a ceramic shaving bowl, this metal shaving bowl combines beauty and durability with its chrome-like mirror finish and stainless steel material. It accommodates shaving soap of any kind, as it works up to a neat and foamy lather. Because of its curved bottom, it’s ideal for many soap refill shapes, and its mirror finish can stand up to glycerine, triple milled, or castile shaving soaps. Some may find that it doesn’t retain heat for too long, but it’s easy to work soap up to a large lather quickly and effectively. This is the best shaving bowl for you if you want to shave in style, with its simple design and beautiful dark wood craftsmanship. To prevent your soap from drying out and cracking, the bowl also comes with a loose fitting lid, and is small enough to be the perfect traveling companion. It’s ideal for soap pucks, and it’s made to be last for hundreds of shaves. Although the bowl allows for a quality lather, it’s recommended not to leave wet soap or water in the bowl, since this can result in the wood cracking or morphing in the long run. Otherwise, it can fit almost any soap, and it’s shallow enough to prevent soap from getting on your hands. For effortless shaving, this simplistic shaving bowl is the optimal tool for your wet shaving routine, for it won’t chip, crack, or peel. It’s made out of stainless steel and is completely insulated, to keep your soap warm and lathered for a smooth shave. The fine polished design gives a luxurious appearance to your bathroom, and with its antiskid bottom, you can lather up your soap without it slipping and making a mess. You can add any kind of soap to this bowl, clean it easily, and have it for many years to come, which is why it’s at the top of our best shaving bowl list. While some may use a self-foaming shaving cream, others like to use a more traditional method of shaving, by manually lathering up soap in a shaving bowl. Whether you choose a wooden, stainless steel, or porcelain shaving bowl, either one can provide you with a rich and foamy lather for a quality shave. 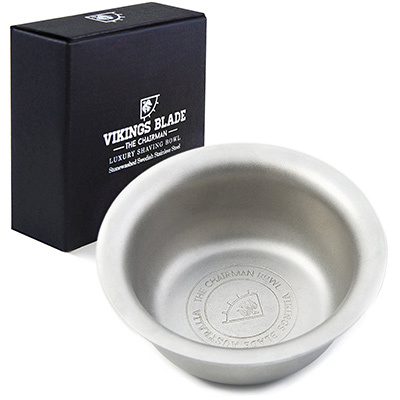 Have we missed any best shaving bowl that you think should have been mentioned? Feel free to share your thoughts and recommend your favorites down below.